Uber Smart Routes: Experimental UberPool feature looks a lot like a bus. 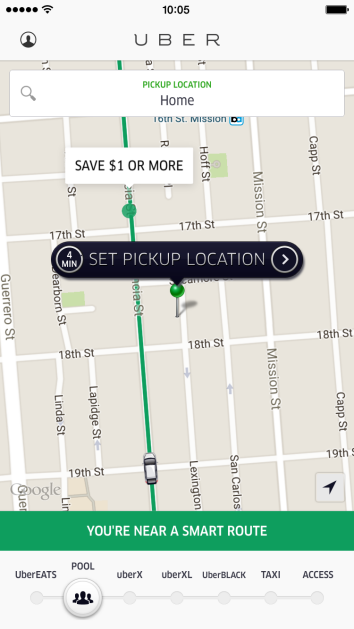 Uber is testing a new feature, “Smart Routes,” in San Francisco. Smart Routes is the latest addition to UberPool, the truest “ride-sharing” option under Uber’s umbrella of on-demand services, since it actually involves sharing and splitting a car with another person who happens to be traveling your way. Smart Routes builds off of that concept by allowing passengers to select a pickup spot along a predetermined route in exchange for at least a dollar off the fare. Currently, Uber is experimenting with two routes in San Francisco: Fillmore Street between Haight Street and Bay Street, and Valencia Street between 15th and 26th streets. Passengers using this option still get to specify individual drop-off points, which do not need to lie along the Smart Route. No, you’re not crazy. Uber basically just announced that it’s invented a bus. UberPool was announced a little over a year ago now as a “bold experiment” designed to further the company’s vision of “a more energy-efficient world with less traffic congestion and pollution in our cities.” Presumably, Smart Routes is an equally bold experiment. The new feature “aims to simplify pick-ups by encouraging riders to request a ride along specific routes in San Francisco,” Uber says in a statement. “Smart Routes is part of our ongoing efforts to increase the efficiency of our driver-partners’ time spent on the road while helping riders save times and money.” See? Bold. With all that talk of efficiency and saving time and money, it almost sounds like Uber is taking the tried-and-true concept of a public bus and privatizing it. To be fair, Smart Routes isn’t exactly like a bus. Pickup locations are flexible along the route, and the drop-off can still be wherever the rider chooses. Also, your typical bus holds a lot more people than your typical Uber car, which means the bus is probably going to make a lot more stops and take longer overall to get from Point A to Point B. (For now, Uber isn’t placing any restrictions on what kind of car you need to pick up Smart Routes passengers.) At the same time, you can kind of imagine a future where Uber starts asking drivers for Smart Routes to have bigger vehicles or, I don’t know, looks into bringing in some people licensed to drive actual buses. Think how efficient drivers would be! Think how much money riders would save! Everyone’s private driver wouldn’t really be anyone’s private driver anymore. Now that would be bold.